December 18, 2011 - One of the largest air crash disaster verdicts was handed down on Wednesday, by a Philadelphia jury, which awarded $11.35 million in compensatory damages to Dr. Robert Marisco Jr. and his fiancee Heather Moran, both of Akron, Ohio, in an action against Winner Aviation Corporation. Dr. Marsico and Ms. Moran were represented by the Wolk Law Firm in Philadelphia. On August 8, 2007, Dr. Marisco, a dermatologic surgeon, and Ms. Moran, a professional pilot, were flying back to Ohio in Dr. Marsico's private airplane, a Cessna T337G, N969CB, when shortly after takeoff from DeKalb-Peachtree Airport in Georgia, on a hot day, after the airplane was about 10 miles from the departure airport, the rear engine failed for undetermined reasons. The pilot turned the airplane back toward the airport, feathered the rear engine, and maintained front engine power at the top of the green arc of the manifold pressure gage, at 33 inches of manifold pressure. The airplane did not maintain altitude at that power setting, and to avoid houses and vehicles on the ground, the pilot performed a forced landing at a water treatment plant. During the landing, the airplane struck the top of a concrete structure, hit the ground, and became engulfed in flames. Dr. Marisco and Ms. Moran both suffered disabling and disfiguring injuries, including third degree burns covering nearly 40 percent of their bodies. At the time of the engine failure, the pilot estimated the airplane was 1,000 to 1,500 feet above the ground, and between 2,700 feet and 3,000 feet above mean sea level (msl). GPS indicated a small airport about 6 miles away, but the pilot felt the larger airport they had just departed, about 10 miles to the south, would be better due to emergency equipment and a control tower. The pilot then began a gradual turn back toward the south, and while doing so, asked the passenger to verify rear engine switch positions. She then attempted an engine restart, and when it was unsuccessful, she contacted DeKalb-Peachtree Tower and advised the controller of the situation. As the pilot was communicating with the tower controller, she noticed that at blue line airspeed, the airplane was losing 50 to 70 feet per minute of altitude. She then feathered the rear engine, but the airplane continued to lose altitude. About 6 to 7 miles from the airport, the pilot advised the passenger, "I don?t think we?re going to make it back," and because there were trees and houses "everywhere," and the roads were "packed" with cars, she looked for an open area where she could land the airplane and not hurt anyone on the ground. The pilot also noted that the front engine rpm was 2,650, power was "to the top of the green," the fuel flow was "right," and "everything was in the green as far as the front engine is going." However, "it just was not keeping us at a safe altitude to get back to the airport." The pilot made an approach to the "green area" of a water plant, cleared a transmission line, reduced power and lowered the landing gear. Her memory after that was not clear, but she did recall the passenger waking her up, and her subsequently assisting him in getting out of the wreckage. The "Single-Engine Maximum Rate-of-Climb Data Chart" found in the owner?s manual indicated that the airplane, at maximum gross weight, and at 5,000 ft MSL, should have been able to climb about 290 feet per minute with the ambient temperature conditions that existed at the time. Notes attached to the chart stated that the operating engine must be operated at 37 inches of manifold pressure, at 2,800 rpm, and that the inoperative propeller had to be feathered to obtain the results listed in the chart. The "Single Engine Service Ceiling Chart" found in the owner?s manual was also predicated on the use of 37 inches of manifold pressure and 2,800 rpm. Dr. Marsico's twin-engine Cessna Skymaster airplane was maintained for several years by Winner Aviation, an aviation repair facility based at Youngstown-Warren Regional Airport in Ohio. Dr. Marsico purchased the Skymaster (which has an engine in the front and one in the rear) in 2006 and selected Winner Aviation as the facility to conduct the FAA-required yearly inspections and all necessary repairs and maintenance. 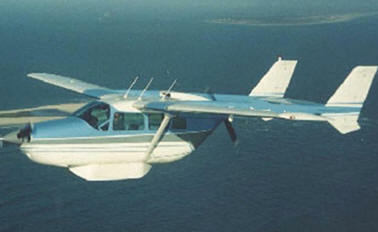 From 2006 until the time of the crash, the Skymaster was plagued with recurrent problems with its rear engine. Winner Aviation performed repeated troubleshooting on a particular component known as a waste gate, when in fact the problems went much deeper. At trial, Ms. Moran and Dr. Marsico claimed, among other things, that Winner Aviation never undertook repairs or overhauling of the rear engine that were necessary to keep it in an airworthy condition. Ms. Moran and Dr. Marsico further alleged that Winner Aviation's misdiagnosis of the recurrent problems of "power loss" in the rear engine was compounded by an alleged failure to have an appropriate inspector investigate all work that was being performed by its mechanics. Ms. Moran and Dr. Marsico also alleged that Winner Aviation was aware that the front engine was long overdue for a complete overhaul, but never recommended an overhaul to Dr. Marsico. Ms. Moran and Dr. Marsico argued at trial that the failure to overhaul this engine or, at the very least, perform a proper inspection and repair of its valve guides and other engine parts, caused a diminution of power during an in-flight emergency, precisely when full power was most important. The lawsuit against Winner Aviation was tried in the Philadelphia County Court of Common Pleas, and the jury found that Winner Aviation was negligent and breached warranties in its inspection, maintenance, and repair of the Skymaster and that this misconduct was a direct cause of the crash. The damages awarded to Dr. Marsico and Ms. Moran are to compensate them for the medical expenses, physical and emotional pain they have endured since the crash and into the future, as well as damages for their disfiguring and disabling injuries. "This is a bittersweet conclusion to a long, hard fought battle with one of the region's largest aviation repair facilities," one of the attorneys for Dr. Marsico and Ms. Moran, James Lebovitz said. "The outcome of this case demonstrates that a citizen's constitutional right to a trial by a jury of her peers is alive and well. ?By reaching this verdict, the jury sends an important message to the airplane repair community--safety of flight for pilots and their passengers is of utmost importance and there can be no shortcomings whatsoever when it comes to the care, inspection, and maintenance of airplanes; and that those who endanger the lives of the flying public will be held accountable for their misconduct."